A Zendesk KPI is a transparent performance indicator that can be used to reliably monitor the quality of a company's customer service department and processes. Zendesk metrics help to analyse and optimise various customer interactions to achieve better results. Tickets & Ticket-Status: What is the status of customer inquiries? First Response Time (FRT): How quickly do you react to customer requests? 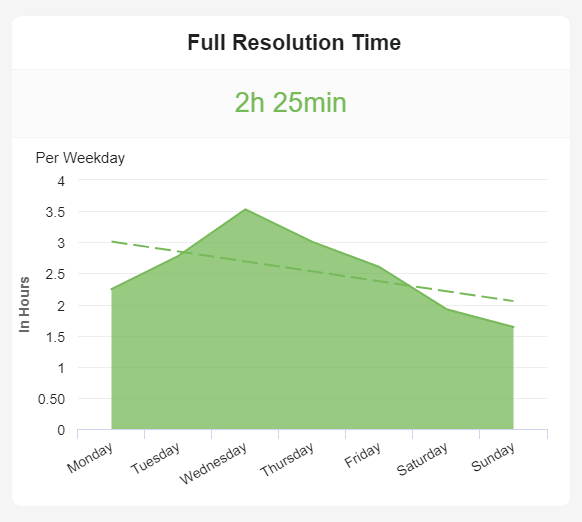 Average Resolution Time: How long do you need to close a request? Customer Satisfaction: How satisfied are your customers with the solution? Tickets by Types: What are the main customer concerns? 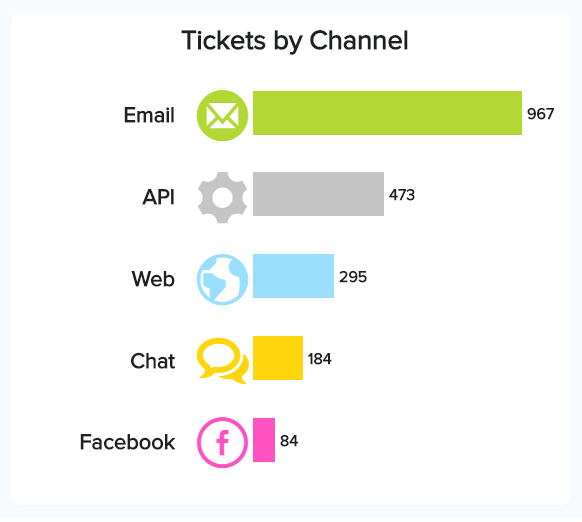 Tickets by Channel: Which contact options do customers use? 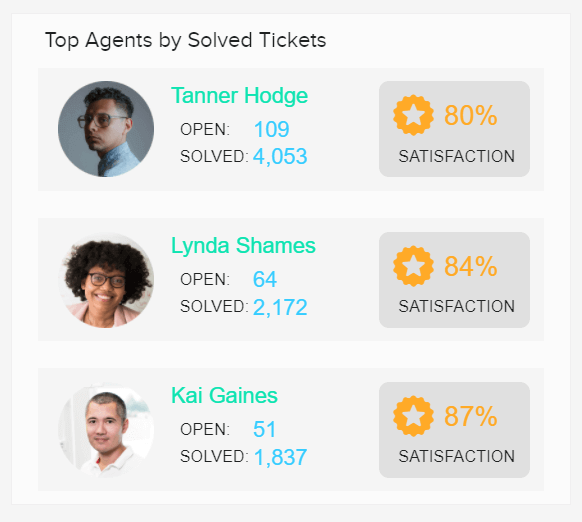 Top Agents: Who is the most effective support agent? First Contact Resolution Rate: How often can tickets be directly resolved? Utilisation Rate: Which employees are not fully utilised? Net Promoter Score: Are customers recommending you to others? What is the status of customer inquiries? Our first Zendesk KPI is the number of support tickets received and the corresponding ticket status. You should always have an eye on these metrics in order to effectively manage the time and resources of the customer service team and to provide customers with high-quality support at all times. The categorisation of a ticket to a ticket status can be set or updated either manually or automatically using defined business principles. 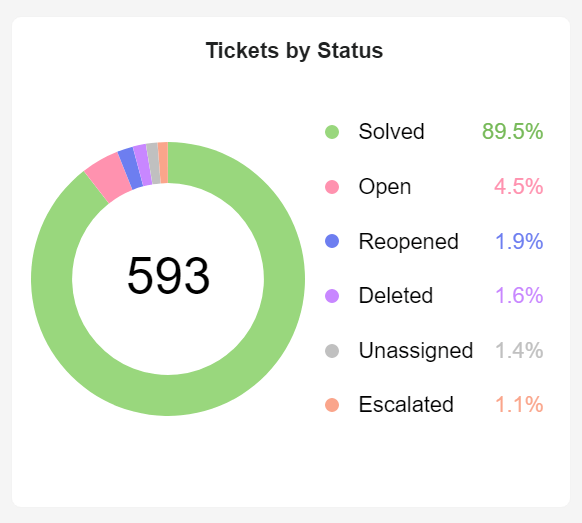 We have shown you 6 exemplary status values of currently 593 processed tickets: solved, open, reopened, deleted, unassigned and escalated tickets. If the 6 default status values in Zendesk (new, open, pending, on-hold, solved, closed) are not sufficient for you to monitor your workflow, you can add individual user or organisation fields to cover them. How quickly do you react to customer requests? 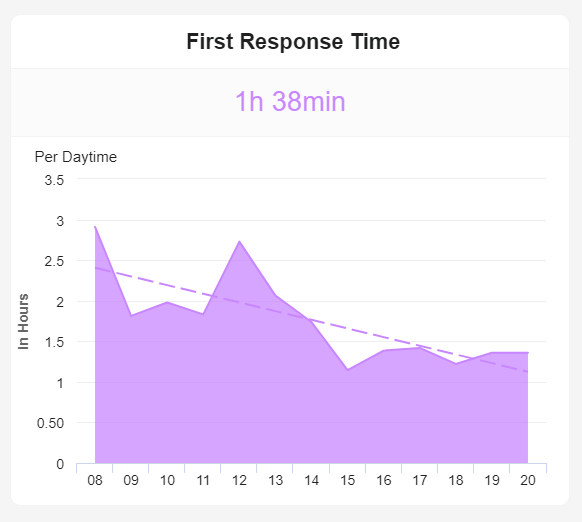 Our second Zendesk metric is first response time (FRT), which is the average time between a customer inquiry to support, and a customer service representative's first response. This indicates how long a customer has to wait before being helped with their request. This has a direct influence on customer satisfaction and it is a great challenge in business practice to keep FRT constantly low, regardless of the time of day or the days of the week. As an example, we have shown you the first response time from 8 a.m. to 8 p.m. as shown in the business information section. For e-mail or live chat enquiries, automated, individualised confirmations of incoming requests are very useful. You can also analyse the FRT for various times of day and days of the week to identify peaks and include them in your planning. How long do you need to close a request? The average response time (or mean time to repair – MTTR) is the average time taken by customer service to resolve a customer issue after it opens. It is usually measured in hours or days, excluding non-operating working hours. Analogous to the first response time already discussed, the average solution time is also directly related to customer satisfaction. The faster customer support is able to solve customer problems, the more satisfied they will be. In our visual KPI example, we have presented the MTTR for different weekdays. Monitor and analyse the average resolution time along with the first contact time to develop the best possible strategy to reduce both metrics. 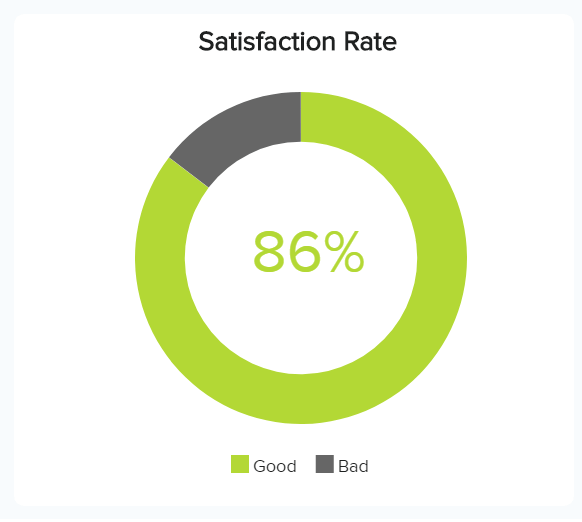 In practice, the customer satisfaction score (CSAT) is a frequently used indicator to measure the satisfaction of customers with the entire company, specific products or even customer support. This is usually measured on a scale of 1-5, but sometimes scales of 1-3 or 1-10 are used due to specific requirements or cultural differences. Emoji-based CSAT questions are also sometimes used. The advantage of the CSAT is in its directness in querying customer satisfaction, which can also be a controversial disadvantage. 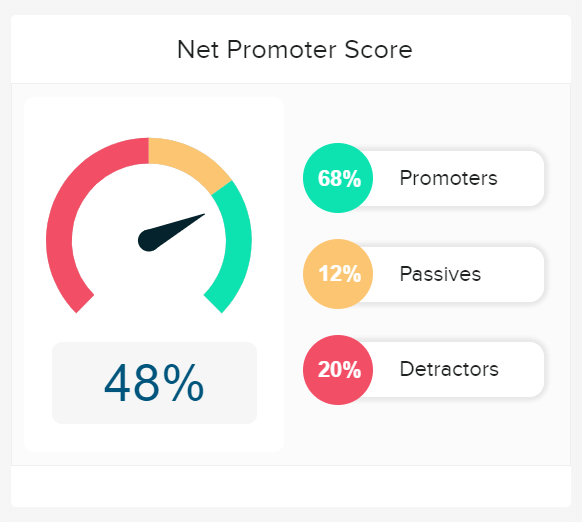 Here the net promoter score (NPS) offers a solution (see below). Periodically monitor customer satisfaction related to customer support. Analyse customer satisfaction for individual teams and support staff. What are the main customer concerns? Our next Zendesk KPI is the number of different tickets by types. Of course, the possible ticket categories for each company are very different depending on the business model and industry. We have presented a possible distribution for a software company: 42% bug reports, 27% setup questions, 18% sales requests and 13% requests for specific software features. Such an overview helps support in planning resources and the necessary know-how to process the requests, but also provides product management with valuable customer feedback on the use of the software, e.g. frequently occurring user problems. Try to divide all customer support requests into a maximum of 5 to 6 main categories in order to conduct in-depth analyses of each category. Which contact options do customers use? This Zendesk KPI shows at a single glance which contact options customers most often use: do customers contact support via live chat, the contact form on the website, or directly via e-mail? Here, too, you should analyse the relevant key metrics already discussed (first response time, average resolution time, customer satisfaction, ticket types) for the individual channels in detail in order to identify optimisation potential. For example, customers who use online chat could be significantly more dissatisfied with the support service than those who send their enquiries by e-mail. Then you should analyse the underlying causes in order to take appropriate countermeasures. Analyse the discussed crucial success factors for the various support contact options. In addition, a trend analysis may be useful to meet future customer needs. Who is the most effective support agent? As already mentioned, you should, of course, also monitor the performance of the individual support employees or teams. This helps you to analyse the quality of customer support as granularly as possible and to identify any weaknesses. For example, a support employee might have a low customer satisfaction score. 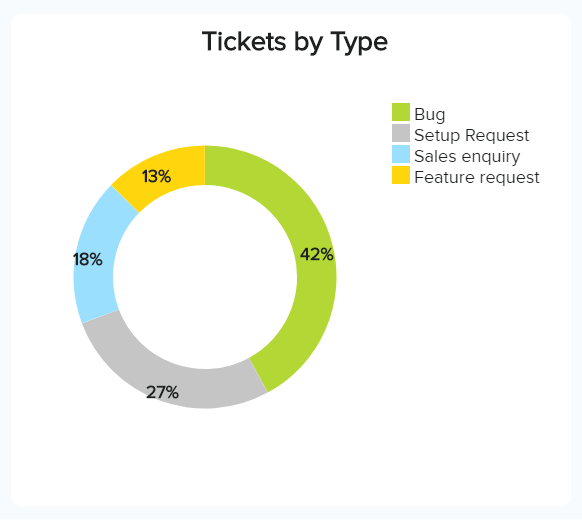 However, a closer look at the customer satisfaction of this support employee by ticket category reveals that he or she does not perform well, especially with setup requests. In this case, further training of this employee regarding the setup of the software could help. Analyse the approach of support staff with particularly high levels of customer satisfaction for your most common support queries. This can provide you with valuable new insights to develop best practices for the entire support team. Become a data wizard in less than 1 hour! How often can tickets be directly resolved? The first contact resolution rate (ELQ) indicates the percentage of support requests or tickets that can be resolved directly with the customer's first contact attempt. An alternative name for the FCR is first fix rate (FFR). In practice, this term is used particularly frequently for telephone inquiries (first call resolution - FCR), but one common term makes sense for all support channels offered. The first contact resolution rate varies greatly from industry to industry; other influencing factors are the selected support channel and the type of ticket. A central success factor for the highest possible first contact resolution rate is a high degree of standardisation and best practice guidelines for particularly frequent customer inquiries. The higher the first contact resolution rate, the better. Thanks to a high first contact resolution rate, service costs can usually be reduced, scalability of the service business model guaranteed, and customer satisfaction increased. Which employees are not fully utilised? 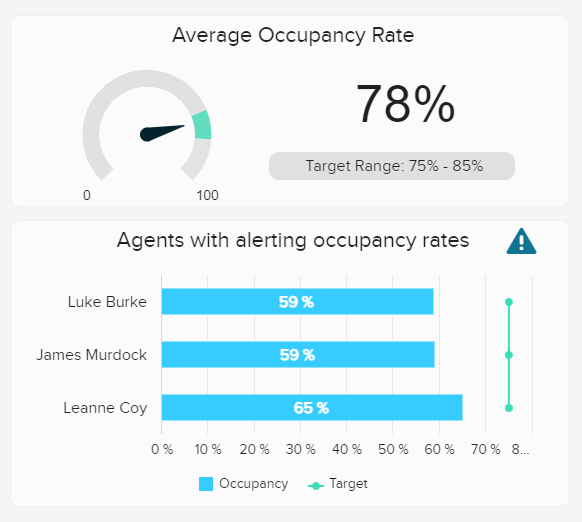 Our next Zendesk KPI – utilisation rate (or occupancy rate) helps you monitor and plan the workload for the entire customer support team, as well as individual employees. Ultimately, it is a measure of how much time employees spend on truly support-related operational tasks, such as processing tickets, managing live chats or answering phone calls. Breaks, meetings or employee training, on the other hand, are not included. 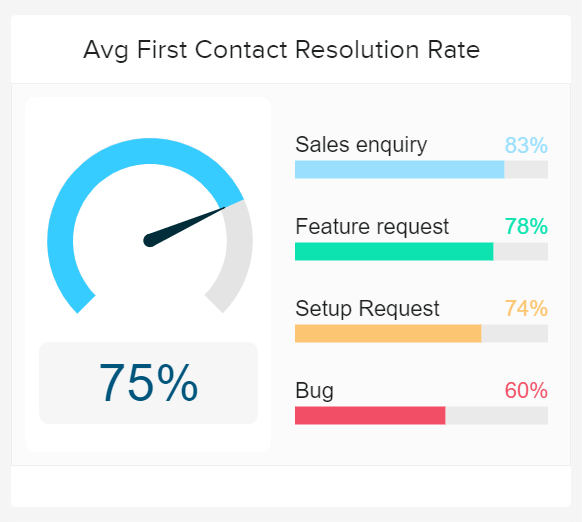 As shown in our visual KPI example, realistic target utilisation rates for the customer support should be between 75 and 85 percent. Monitor the utilisation rate on a team and employee basis. For significantly lower or higher utilisation rates of individual employees, analyse the underlying causes. Are customers recommending you to others? The net promoter score (promoter surplus) is another important indicator in customer support to measure customer satisfaction. In contrast to the customer satisfaction score (CSAT), the net promoter score indirectly measures the customer satisfaction with the customer's willingness to recommend a company. The following question is used: "On a scale of 0-10, how likely is it that you recommend our company to a friend or colleague? Then only answers with 9 or 10 are rated as "promoters" (advocates), whereas 0 to 6 are considered critics (detractors). Answers 7 and 8 are not considered any further, as they are undecided (passive). Subsequently, the difference between promoters and critics is formed and finally a value between -100 and +100 is obtained. In addition to the CSAT, use the net promoter score to measure customer satisfaction and compare the results. With the net promoter score, values of over 40% can be rated as good, over 50% as very good and over 60% as excellent. Setup only takes a few minutes. No credit card required!